With every new revision of Windows comes the process of migrating to it. Many of you will be initiating a clean install instead of an in place upgrade. Before you do that though, you will need to ensure your data can move to the new version of Windows or that new device you will be buying. In this article, we take a look at backing up your files, specifically, we look at backing up manually. Recent versions of Windows include File History, which was introduced in Windows 8.0 in 2012 but based on my personal experience, it is not as thorough as Windows Easy Transfer which is no longer available or supported. A manual backup is also handy for migrating your personal files to a new PC or an important way to ensure your data is kept safe. What you need to start this project? The first thing I recommend you do is invest in an external hard disk. I can't exhaust this enough; they are affordable and can store lots of data. You can probably get a 4TB drive for around $100. Keep in mind, if you have a complex configuration, this article does not delve into the nuances of multiple partitions or drives with data scattered across them although the same rules can apply in regards to backup. If you do have folders for data such as documents, music, pictures and videos stored on other partitions or drives, then I would recommend you disconnect these data drives and upgrade only the system partition. You can always reattach your data drives after setup is complete. You want your backup to be as thorough as possible. Within your User folder is a hidden directory called AppData. This folder stores important settings for the apps you use, such as custom directionaries for Microsoft Word, passwords for apps like Chrome, Outlook data files and mail folders for apps like Windows Mail. To turn on Hidden Files and folders, start by opening your user folder. Press Windows key + R then type: %userprofile% then hit Enter on your keyboard. Windows 8/8.1/10 - Click the View tab then click Options then click the View tab. Under Advanced settings > Hidden files and folders select the radio box Show hidden files and folders. AppData folder is now visible. After completing the above steps, you should now see the AppData folder appear in your user folder. Edit > Select All (Windows XP). Click Edit > Paste (Windows XP). Depending on the amount of data, this can take a while. If you have more than one account on your computer, log into each account and repeat the same steps. Make sure a unique folder is created for each account you backup manually. NOTE: Some apps will keep their own data stores within their application folders, so make sure you browse and copy those over if necessary. Some users have a tendency to store files at the root of the hard disk, normally where the operating system is installed (Local Disk c:\). Also check there for any important files and move them to Documents folder. Once your backup is complete and you have your new computer setup and Windows is installed and running, the next step is to copy over your files and folders from the external hard disk. 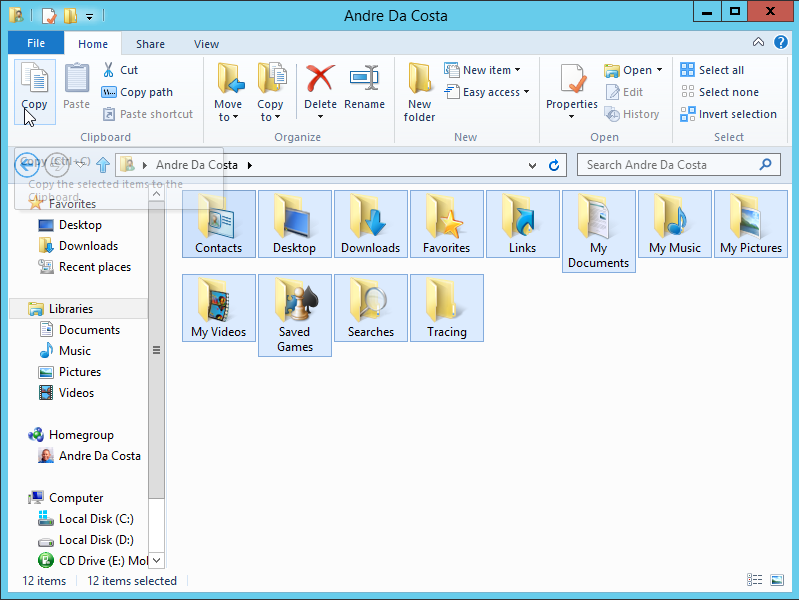 You can do this two ways, you can individually copy the contents of each folder into the respective folder on the new computer from the external drive. Here is what you can easily do. Connect and turn on your external hard disk. Browse the backup folder with your backed up folders. Press Ctrl + A or Click Organize > Select All (Windows 7), Home tab > Select All (Windows 8/8.1/10), Edit > Select All (Windows XP). Press Windows key + R then type: %userprofile% then hit Enter on your keyboard. Press Ctrl + V or Click Organize > Paste (Windows 7), Home tab > Paste (Windows 8/8.1/10), Edit > Paste (Windows XP). You will be prompted if you want to replace the folders, click Yes. If you have other accounts, make sure the respective accounts have been created and logged into then repeat the same steps. How to: What to do if your currently installed build of Windows 10 expires? As well as the file level backup described in this article (the only way to backup all the data and then selectively restore) I also create an image of the system disk (note, this is the entire drive, not just the OS partition) just in case the system gets really, totally, trashed! The downside is, of course, that any restore is of the entire drive only. I've tried this method to move all user data from a windows 7 to windows 10 and ended up with a desktop that is not usable. When I try to open folders an error is thrown saying that I have no rights to open it. I can't see the properties of the folders, and start menu doesn't work. The only way to log off is using ctrl+alt+supr. It would have been nice if this information would have been included prior to the upload. Now all data is lost. I admit I may be a novice, but it is unfair that the data is lost and Microsoft wasn't more conscientious and concerned for the novice user. Maybe I'll just be a sucker with hopefulness... Right now I'm coping the Apps stuff to my external hard-drive. Stay tuned! That is what I needed to know! Thanks. Hope this is the cause as ziI always get the error that PC Matic did not backup? I followed your instructions, although I'm not looking for a backup option. I just want to know what is going to Drive D and why? However, the success has been that by "showing hidden files", I can now see what is in D Drive. There is something on it called "Media Server Temp". I have deleted this and now D Drive is back to normal. I have no idea where this came from or how it got there. I have no idea what is going to happen next time I do something with videos etc. But for now, I am just happy that my recovery drive (D) is no longer RED.